This wall seems to be nervous…when you approach it, it starts to jump and move! 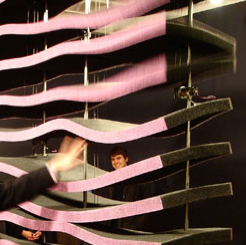 Designed by an architecture firm in New York called nARCHITECTS, the wall is made of foam and a bunch of electronic sensors that can tell when someone is near it. Once it senses you, it causes the foam to move, like it is a nervous person, who does not want to get touched. See more about the “Party Wall” as nARCHITECTS call it. It is pretty fantastic! We are not sure when you want to have this kind of wall in your house, except as a kind of conversation piece – but it sure looks like fun. More fun than a barrel of monkeys or a pit of plastic balls – maybe equally as fun as a trampoline.